Last Wednesday, the Minnesota Timberwolves team has announced that the organization is working in a contract extension with guard Andrew Wiggins. The news were announced by the head coach and the president of basketball operations Tom Thibodeau. The president told the press that the potential extension would be a five-year deal worth $148 million. The T-Wolves acquired Wiggins some years ago from the Cleveland Cavaliers to replace forward Kevin Love. 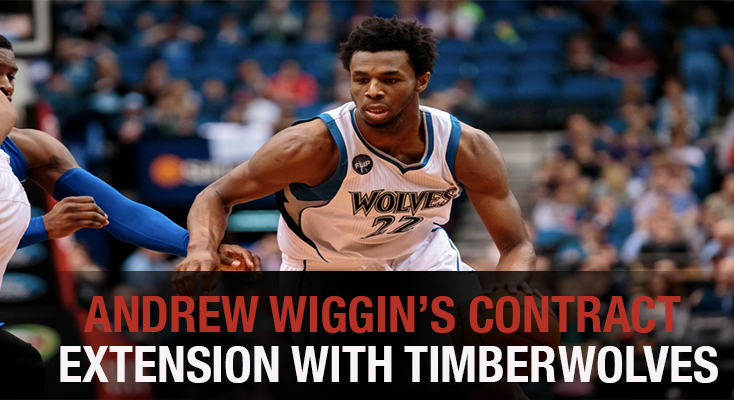 The rookie-scale extension would have to be ready one day prior the regular season minimum, and it would pay Wiggins $25.5 million next season. Statistically talking, last season was a good one for Wiggins, as he averaged a career-high 23.6 points per game with a 4.0 rebounds, 2.3 assists, 0.4 blocks and 1.0 steal. He also shot 45.2 percent from the field, setting a new personal best 35.6 percent of the time from long range. In one-on-one situations, he performed adequately but in off-ball settings the player he’s one of the league’s least valuable defenders. He played with three different coaches in three different years and sports specialists said that affected his development. The 22-years-old player is key in the T-Wolves, along Karl-Anthony Towns, being the major players in the Western Conference for years to come. During offseason, Minnesota added to their lineup Jimmy Butler, a trade with the Chicago Bulls. This new acquires give the team a chance to end a 13-years drought. The teams expects he will fully commits to understanding and executing the defensive schemes so he can explode his full potential. Wiggins can still be one of the NBA’s best players, he just need to develop discipline in off-ball settings and earning such status. Wiggins is one of the former rookies of the year and the decision to take him on the team was betting on his future capability and a standout upward trajectory.